I have driven past the Pre Funk bar in Boise countless times and have always wanted to give it a try, but never made it out there until just last weekend. I don’t go out to bars very often any more, however there was something about the look of Pre Funk that made me want to learn more. It also helps that being only a mile away from my house it’s within walking distance. We had dinner plans on Friday so we decided we would walk over to Pre Funk and give it a try before walking downtown for dinner. Before heading out I did a Google search to find out what exactly Pre Funk had to offer and I was quite impressed. Pre Funk offers an extensive list of craft beers, most of which I had previously never heard of (check out their tap list). I’m not very adventurous when it comes to drinking, and I tend to stick to handful of beers (Yuengling on the East Coast, Corona, Sam Adams or Smith and Forge Hard Cider out here where Yuengling can’t be found). Pre Funk is a great place to discover something new. I tried out the Square Mile Cider, which is a rather new beer and company out of Oregon. I immediately fell in love. It was cold, refreshing, smooth and easy to drink yet still tasted like beer as opposed to an overly sweet hard cider. I loved it so much I didn’t allow myself to try anything else the rest of the night. I had a few before dinner and had to stop off on the way home to get one more before calling it a night. The bar is housed in a former garage and I really enjoyed the atmosphere, lighting and outdoor seating. Pre Funk is quite clean, and wasn’t loud of obnoxious at all during our visit. There was a nice variety of music playing at a comfortable volume, and the atmosphere almost feels like a Starbucks for beer drinkers. In fact Pre Funk’s ‘about‘ page describes the bar as “the party before the party… Come here before you go there” and I think that’s a great description. It’s a great place to go and grab a few awesome beers before or after dinner and enjoy good conversation in a wonderful atmosphere. 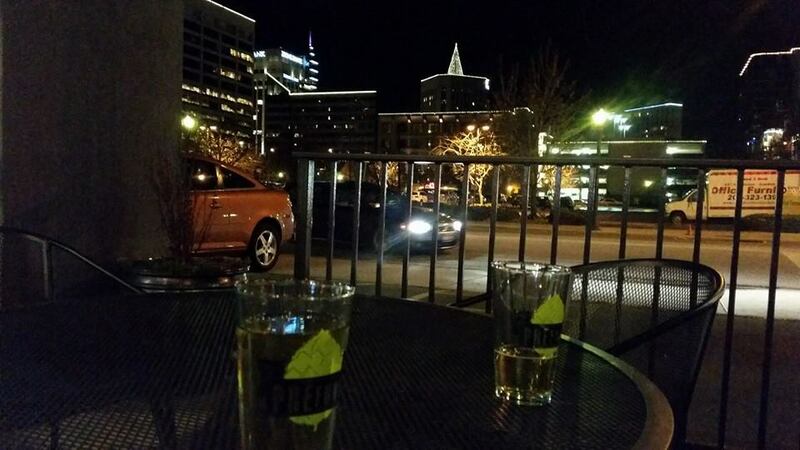 I absolutely love the view from the outdoor seating area at night, I adore viewing the city while enjoying a great beer. This entry was posted in Beer, Boise and tagged Boise, boise bars, Pre Funk, Pre Funk Boise, Square Mile Cider. Bookmark the permalink. Where is Telltale’s Game of Thrones on Xbox One?